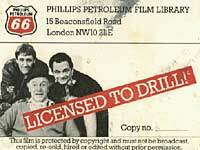 The plot of the story is how Del Boy ‘educates’ Rodney and Grandad in all things oil. Telling them of its many by products, and how it affects us in everything we do. From the Corn Flakes we eat in the morning (no they don’t actually contain oil) to the clothes we wear and the fertiliser we use on the allotment. They then watch a programme ‘on BBC 2′ about Oil Exploration. After watching the documentary Rodney asks the most poignant question we are all thinking, which is ‘What I don’t understand Del is why you’re so suddenly interested in oil?’ Del’s obvious response is ‘co’s we are gonna earn out of it’. He then tells Rodney and Grandad that he has bought an oil rig for £400, and how it is in a lock up in Catford. Rodney then explains how this cannot be possible, and Del finally realises he has been conned. In the morning Rodney wanders through the living room to collect the newspaper from the doormat. As he crosses the set, we see a man sitting at the table, Rodney doesn’t notice until he is about to leave the room. Del enters from the kitchen and gives the man a big wad of money then the man leaves. Rodney wants to know what’s happening so Del tells him and Grandad over breakfast he’s bought an oil rig for £400!!! Then…….,well you’ll have to go to the convention to find out what happens next! Made during the Gulf War - this short film was made straight to camera with any mistakes made included, it was scripted but also had pieces of improvisation, Enjoy the full video below.